Dean Cox’s second half winner kept Orient the only 100% club left in the football league. It was far from plain sailing for the East London club who’s manager Ian Hendon revealed post match that “Newport were full worth a point”. In a frantic opening period, Orient raced into a 2-0 lead with Paul McCallum and Jay Simpson netting their third goals of the season inside 7 minutes. Orient should have added more through Paul McCallum but the score remained 2-0. The game then turned on its head when Scott Boden turned in Scott Barrow’s cross at the near post to halve the deficit before just a minute later County captain Mark Bryne fired home from 25 yards. Orient were shell shocked with the home side in the ascendancy but Hendon responded bringing on Ollie Palmer and Blair Turgott and within 5 minutes Orient grabbed the winner. 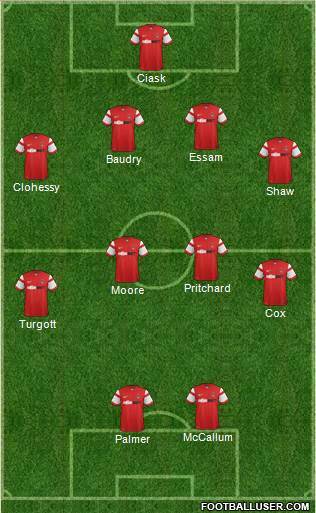 The two subs combined with Turgott’s cross turned in at the near post by Dean Cox to keep Orient top of the tree. County, who had only managed 1 point from 3 games prior to kick off, made 2 changes from their defeat to Hartlepool in midweek. Kevin Feeley came in for Kieran Parselle while Zak Ansah who joined on loan from Charlton in midweek made his debut ahead of Aaron Collins. Orient were able to name the same starting 11 for the fourth consecutive league match with Cox, McCallum and Jay Simpson continuing having been involved in 5 out of the 8 league goals scored. The O’s ,who went top on Tuesday after their 3-0 win over Stevenage, continued where they left off as they started the brighter. 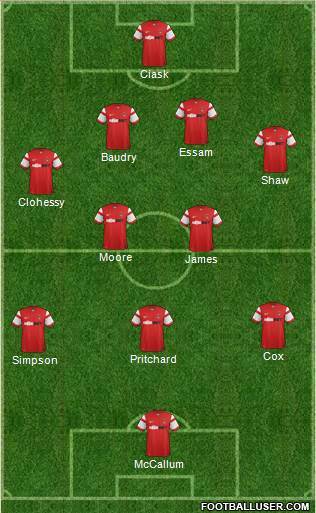 Butcher’s county lined up in a 3-5-3 system and looked to utilise the wing backs of Danny Holmes and Seth Nani Twumasi. However, in the opening stages this was causing problems as the O’s were exploiting the space left by the high wing backs. 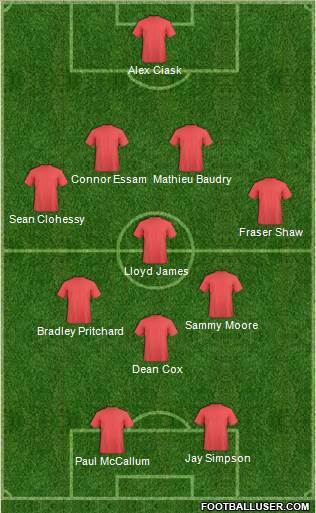 Sean Clohessy and Bradley Pricthard were linking up really well down the right. After just 4 minutes it was the league leaders who edged in front, after good work down the right saw Jay Simpson played in. His cross missed McCallum in the center but Dean Cox retrieved the ball on left, turned and crossed for McCallum to head in off the underside of the bar for his third of the season. Backed by over 500 travelling away fans, Orient pushed for a second and just 3 minutes later they doubled their advantage. Another free flowing move saw Clohessy feed Simpson on the edge of the box, the former Gunners man moved the ball onto his left foot and from outside the area unleashed a curling left foot shot into the top corner of Joe Day’s goal. County were struggling to contain the East London side who were pressing them high looking to force mistakes. Hendon’s side were oozing confidence and with the high pressing almost grabbed a third. Dean Cox robbed Regan Poole in possession, he approached on goal but his shot was saved with McCallum failing to find his strike partner Simpson with the rebound. After just 18 minutes the contest should have been over, Bradley Pritchard nicked the ball in midfield, pressing forward he found Cox in the right channel. Cox looked up and his fired cross found McCallum free at the far post but to the surprise of all the away fans, the front man headed over. With a 2 goal cushion, the O’s looked comfortable and saw McCallum go close once more, his header from a Cox corner bounced off the woodwork three times before going to safety. County started to grow into the contest with Mark Byrne having a goal bound shot blocked by Mathieu Baudry but Orient still threatened on the break. Hendon, operating his diamond formation, allowed Danny Holmes and Seth Nani Twumasi more space down the wings. Kevin Feeley headed over from a corner before Scott Barrow gave Orient a warning sign with a run down the left. 4 minutes before the break, Orient didn’t heed the warning as Barrow crossed for Scott Boden who turned home at the near post to halve the deficit for the Exiles. With Orient in disarray after the first goal, Marky Byrne drew the Welsh side level just a minute later, after good play down the left Byrne received the ball in the middle of the park. He set his sights on goal, unleashing a 25 yard strike beyond Ciask to draw the scores level. The comeback was nearly complete before half time but Ciask turned over a Danny Holmes shot. Hendon’s side needed half time, the O’s fans looked in shock, dominating the game and in complete control then to collapse within a minute was disbelieving. “This is Orient was uttered in the stands” but this would be a real test of character for Orient. Despite a change of formation to 4-2-3-1 from the away side, County continued where they left off before the break. Feeley forced Ciask into a save following a Byrne cross which found the center half at the back post. For Orient’s supremacy in the first half hour, the league leaders were finding it hard to contain County who were backed by a vocal crowd. With Orient second to the ball in midfield, Hendon reacted 9 minutes in to the second half bringing on Ollie Palmer and Blair Turgott for Lloyd James and Jay Simpson. The change got the desired rewards after just 5 minutes, Palmer flicked on to McCallum who in turn found Turgott on the right wing. The former Hammers youngster crossed for Cox who had got across his marker to turn home at the near post to put Orient back in front. Orient pushed for a killer fourth and looked more composed in the new formation, Turgott failed to meet a Cox pull back as County still remained firmly in the contest. Boden headed over for the hosts as they searched for a second equaliser. The Exiles replaced Ansah with Aaron Collins but it was Orient who threatened but Palmer volleyed over at the back post. Cox who Hendon later revealed post match “that he felt his hamstring” was replaced by Scott Kashket as Orient looked to shut out the game. Butcher brought on his second loan signing with Josh Laurent replacing Scott Boden. County were beginning to have more and more joy down the right flank with Fraser Shaw and Kashket struggling to deal with Danny Holmes. Palmer nearly wrapped up victory with a fourth but his shot was deflected for a corner. County could sense an equaliser and kept pushing men forward but Scott Barrow’s run and shot crept past the post. Orient were holding on and substitute Aaron Collins should have made it 3-3, after Elito was found in the left channel he pulled back to Collins. He made space to shoot with his left foot but his shot went agonizingly wide of the far post. The O’s were trying to run the clock down but County had one more chance but Josh Laurent toe poked over in the dying seconds. Orient battled out for 3 points in Wales but the ease that County drew level could be a worry for Hendon. The O’s looked in cruise control for the opening half an hour and should have wrapped the game up, they had chances and on another day could have been punished for not taking them. Despite that, once more Hendon changed the game before it got away from them. The tactical switch to 4-4-2 bringing on Turgott and Palmer forced the third and decisive goal. A resolute win with Moore and Pritchard once again working their socks off which sees Orient go 2 points clear at the top. 3 formations in one game highlights that Hendon has the ability and knowledge to change a game to get the result. Hendon revealed to leytonorient.com post match that “Newport were well worthy of a point” but his O’s side sit top of the tree ahead of a home visit of Bristol Rovers. The O’s created chances and the character which his side showed in the second half will please the former Hammers coach. A tough assessment for Hendon’s side which they overcome in the end but only just. The quality of the squad was highlighted once more with the impact of Turgott and Palmer off the bench. However, today’s collapse at the end of the first half concerned the away fans but at the moment something feels different with this Orient side. It may have highlighted that Hendon needs to add to his squad before the window closes.